The Print Group is a multi format printing and promotional company, with capabilities which include traditional full color offset printing as well as full color digital. 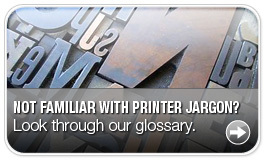 Our copying department also has high speed equipment with booklet making ability. 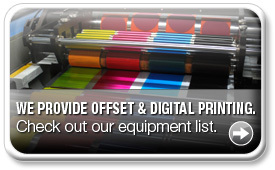 We are proud to use the latest offset/digital technology from Hp Indigo, Hamada, Mitsubishi as well as Cannon. Our full service bindery is capable of several types of binding as well as folding, scoring, shrink wrapping, UV coating and padding. With ever changing technology affecting the print industry, print service providers are being pushed into new and exciting territory. At The Print Group, we have embraced this change and are constantly adding new equipment to control costs and minimize turn around time. 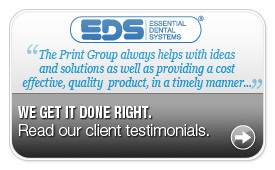 With decades of experience in the printing industry we are your source for printing and promotional products. Our goal is to provide the results you demand at competitive pricing. Our customer service staff is always available to answer your questions and make suggestions for cost effective ways to produce your project. We welcome you to visit us to discuss your project and take a complete tour of our facility.